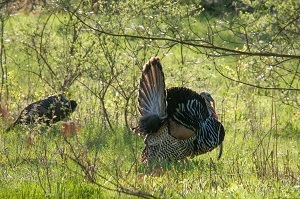 The Vermont Fish & Wildlife Department is hosting a hunter education weekend for adults that will be focused on turkey hunting during the final weekend of Vermont’s spring turkey hunting season, May 24, 25 and 26. “We are partnering with the National Wild Turkey Federation, Back Country Hunters and Anglers, the Silvio Conte National Wildlife Refuge, and Vermont hunter education instructors to help people learn about turkey hunting, interpreting the landscape for hunting, as well as processing and cooking a wild turkey,” said Information & Education Specialist Nicole Meier. The event will be held at the Northwood’s Stewardship Center, 154 Leadership Dr, Island Pond, VT 05846. A $60 fee will cover food and lodging for participants who may stay in the bunkhouse or in their own tent. “Friday and Saturday will include learning all about hunting wild turkeys, and participants will go hunting with an experienced mentor on Sunday morning,” added Meier. Contact Nicole Meier for an application by email at Nicole.Meier@vermont.gov or by phone at 802-828-1193. Completed applications must be returned in by May 10.